Lasthenia californica DC. ex Lindl. sensu Ornduff (1966; 1993), the common goldfields of California, provides an ideal system for the study of parallel speciation driven by edaphic forces. Common goldfields, as previously delimited, displays the widest range of edaphic tolerances within the genus, occupying diverse habitats within the Californian Floristic Province (Ornduff 1966; 1993). 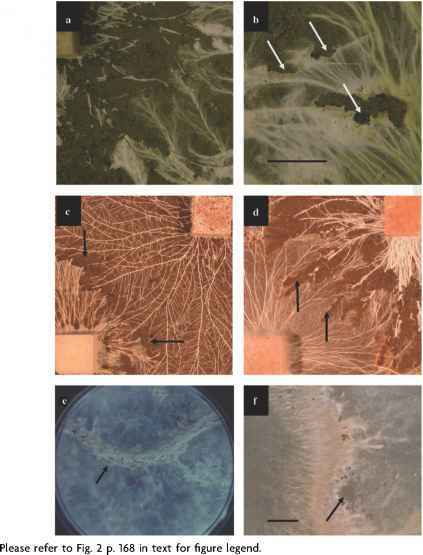 Despite the range of habitats occupied by populations within the complex, a survey of soil features and elemental composition of plants (Rajakaruna and Bohm 1999) concluded that flavonoid races previously described for the complex (Bohm et al. 1989; Desrochers and Bohm 1993) correspond to edaphic races. Race A plants predominate in ionically-extreme habitats such as coastal bluffs, alkaline flats, vernal pools, and serpentine outcrops; these plants are characterized by the presence of sulfated flavonoids (Bohm et al. 1989). Race C plants are found in ionically-benign but drier sites such as roadside pastures and oak-woodlands; these plants lack the sulfated flavonoids characteristic of race A. Interestingly, the two races grow in parapatry on a serpentine outcrop at Jasper Ridge Biological Preserve (Stanford University, San Mateo County, CA), but at this site, each race occupies microhabitats that correspond to the edaphic conditions that distinguish the races throughout the range of the complex. Given that we suspect that selection has contributed to the establishment and maintenance of the patterns of distribution of the two races, both at Jasper Ridge and throughout the species range, we initiated a study to examine relationships among populations of the complex. The major findings, outlined below substantiate the role of selection and point to parallel origins of at least one of the edaphic races. Traits and taxa can evolve in parallel by means other than natural selection. For example, multiple independent origins have been documented for numerous plant polyploids and for diploid hybrid taxa. Here, we are concerned with parallel evolution sensu Schluter and Nagel (1995) and Levin (2001), implying the action of natural selection. Levin (2001) suggests two criteria that are necessary to demonstrate parallel evolution of a taxon. First, populations of the descendent taxon must be phylogenetically independent. Second, the shared characteristics must be the products of natural selection. Where parallel evolution results in parallel reproductive isolation, parallel speciation is demonstrated. Schluter and Nagel (1995) provide two additional criteria necessary to document parallel speciation. The third criterion states that separate descendant populations that are found in similar environments must be reproductively isolated from the ancestral populations. Finally, the separate descendant populations must not be reproductively isolated from one another. Few cases exist in which all four criteria have been addressed (Schluter and Nagel 1995) and Levin (2001) indicates that there are almost no unassailable examples of parallel speci-ation in the plant literature. We will present evidence to address each of these four criteria in Lasthenia californica. While the evidence is not complete in each case, in our opinion, it clearly demonstrates parallel evolution, and points toward parallel speciation. We will note areas in need of further corroboration and outline our plans for additional studies. Based on a comprehensive ITS/ETS/cpDNA phylogenetic study, Chan et al. (2001; 2002) found that L. californica sensu Ornduff represents two geographically-based, non-sister clades. Chan (2001) and Chan et al. (2002) recognized the clades as two cryptic taxa, L. californica subsp. californica representing the northern clade and L. gracilis DC. (Greene) representing the southern clade. The molecular phylogeny allowed us to examine the relationship of the edaphic races to the newly recognized phylogenetic taxa. If ecological selection has played a role in the origin of edap-hic races, then similar edaphic tolerances may have evolved in parallel within one or both of the phylogenetic taxa. Indeed, a previous study of allozyme variation (Desrochers and Bohm 1995) indicated that single populations of race A and C cluster with sets of populations belonging to the alternative race. We determined the edaphic race and phylogen-etic affinities of 33 populations from throughout the range of the complex. Flavonoid profiles were used to assign populations of Chan et al. (2001, 2002) to edaphic races and characterization of nuclear ribosomal ITS regions of several representatives from the two edaphic races were used to determine phylogenetic affinities (Rajakaruna et al. 2003c). Examination of flavonoid profiles and ITS sequences revealed that edaphic races are not concordant with the newly circumscribed taxa, L. californica subsp. californica and L. gracilis. Of the 16 populations of L. gracilis, 13 were race A and 3 were race C. Of the 17 populations of L. californica subsp. californica, 11 were race C and 6, race A. Furthermore, a distance-based analysis of RAPD variation (Rajakar-una 2002) rooted using the information from phylogenetic markers indicates that race A is most likely ancestral in the complex, resulting in an inference of parallel origin of race C in each of the two clades. This further implies that the sul-fated flavonoid that is diagnostic for race A was lost independently in derived populations of Race C.
Fig. 1. Total shoot sodium (left) and shoot/root sodium (right) for race A and C populations belonging to L. californica subsp. californica (AC and CC, respectively) and L. gracilis (AG and CG, respectively). 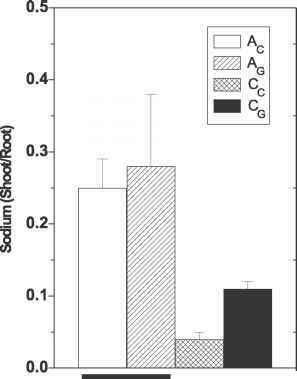 Race A populations of both species allocate significantly more sodium to shoot than race C populations. estimates also indicated greater tolerance by race A to Na+ (Rajakaruna et al. 2003a). Further, significant Genotype x Treatment interactions were observed for all tolerance measures, suggesting that these races are genetically differentiated in their tolerance responses. As described above, results of population genetic studies suggest that race A is ancestral in the complex and therefore both the sulfated flavonoids and Na+ tolerance have been lost in race C populations. While the genetic basis of these differences and their correlation with habitats of race C suggest that they contribute to differential adaptation, it is not clear how the loss of these traits is adaptive, unless they result in a relative fitness cost under the conditions in which race C occurs. This hypothesized cost of tolerance seems plausible, and seems to agree with the results of a drought stress experiment that we conducted using seed from race A and race C populations at Jasper Ridge (Rajakaruna et al. 2003b). At Jasper Ridge (and throughout the range of the complex), race C populations occur in ionically-benign and water stressed environments (Rajakaruna and Bohm 1999), while race A occurs in ionically challenging but wetter sites. We examined the relative fitness of individuals of the two races under varying levels of drought stress. We conducted an experiment in potting soil in the greenhouse that showed that race C plants from the Jasper Ridge site are more drought tolerant than race A plants from this site (Rajakaruna et al. 2003b). Race C plants reach reproductive matu rity faster and have greater reproductive fitness under drought conditions. It is unclear at this stage whether drought tolerance is unique to all race C populations, however it seems likely given the water-stressed nature of their edaphic habitats. The coincident loss of both sulfated flavonoids and traits responsible for Na+ tolerance is of interest in light of the possible link between these traits (Barron et al. 1988). Sulf-ated flavonoids are often found in plants growing under saline conditions and we recently hypothesized that there may be an ecologically related adaptive mechanism linking their presence to salt tolerance (Rajakaruna et al. 2003c). Hence, it is possible to envision the loss of these potentially linked traits in race C populations not exposed to salinity or other ionic stresses. The loss of these traits combined with a gain in tolerance to water stress is plausible under the known climatic and edaphic shifts that have taken place in California (Howard 1951). Ostensibly, a shift from wet, saline conditions to dry, non-saline habitats could have led to a relaxation of selection on traits conferring salt tolerance while selecting for traits such as early flowering and lower root/shoot ratios that confer drought tolerance. Further, studies have shown that salt tolerance may have a pleiotropic effect on early flowering (Taeb et al. 1992). This study shows a possible link between differential adaptive traits observed for the two races in the L. californica complex: early-flowering and Na+-intolerance in race C and later-flowering and Na+-tolerance in race A. Fig. 2. Mean percent seed set within and between race A and C plants belonging to both phylogenetic species (clades). Interracial seed set is significantly lower than intra-racial crosses both within and between clades. Fig. 3. 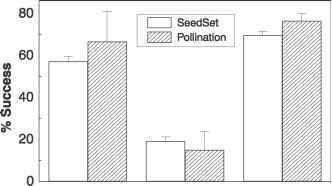 The relationship between pollination success and seed set in experimental crosses within and between races of Lasthenia californica. Most of the isolation comes about by pollen incompatibility reactions, i.e., isolation between races both within and between clades is determined primarily by a prezygotic and postmating mechanism. appears to be strongest in inter-racial crosses both within and between clades. According to theory, if reproductive isolation is evolving as a direct or indirect consequence of edaphic specialization, we would predict greater reproductive compatibility between independently derived populations of race C than between race C populations and their closely related race A counterparts. Our preliminary observations are consistent with this prediction. 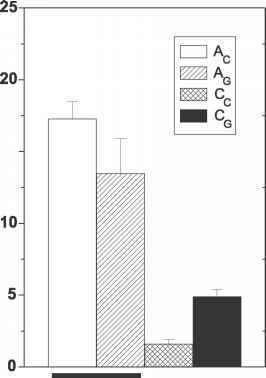 Examination of pollen tube growth following experimental crossing (Fig. 3) reveals that the mean pollination success of race C populations with race A populations from the same clade is 5%, while the success rate of crosses between race C populations of distinct origins is 40% (Rajakaruna and Whitton, unpublished). We must caution though, that we consider these findings preliminary, and in particular we note that the patterns of interpopulation crossability are highly variable and will require careful study to tease apart the contributions to reproductive isolation of divergent selection on edaphic tolerances versus other effects. Nonetheless, our observed trends corroborate the final two criteria of Schluter and Nagel (1995), i.e., descendent populations must be reproduc-tively isolated from ancestral populations, and separate descendent populations must not be reproductively isolated. The role of parallel evolution in the origin of species is at an early stage of discovery and we believe that our studies identify a system that can be used as a model for the study of parallel speciation in plants. Ongoing studies are aimed at providing additional supportive evidence to further our hypothesis of parallel speciation of edaphic races in the L. californica complex. Furthermore, our findings from Lasthenia californica must not be taken in isolation, as our review of the literature leads to the hypothesis that parallel evolution may be relatively common outcome of edaphic divergence, and that edaphic divergence can have effects on reproductive isolation that could lead to parallel speciation. Thus, these systems are ideal settings in which to study the link between adaptation and speciation.